Meebo is integrated, all-in-one instant messaging that connects you with your friends everywhere. 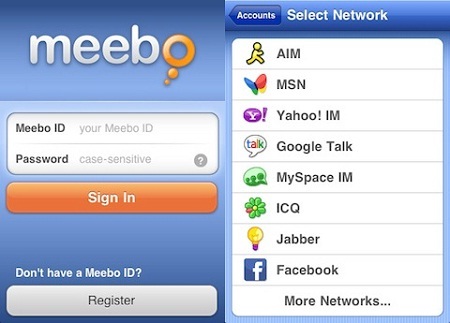 Meebo has been the leading platform for multi-protocol IM on the web since 2005. With that knowledge and experience, we optimized Meebo on the iPhone for speed, simplicity, and performance. AOL / AIM, Yahoo!, Windows Live Messenger, Gmail / Google Talk, Facebook, MySpace, and 100+ other networks! - Rotate for landscape mode and a wider keyboard. Meebo is completely free, and is ad-supported.